Windows 10 was released worldwide on July 29, 2015. The upgrade for Windows 7/8/8.1 systems is free until July 29, 2016. Unlike earlier Windows releases, you need to get an update to upgrade to Windows 10 and not a downloaded installer or CD/DVD to upgrade. Here’s everything you need to know about the Windows 10 and how you’ll upgrade, along with everything you need to know about what’s coming for Microsoft users. 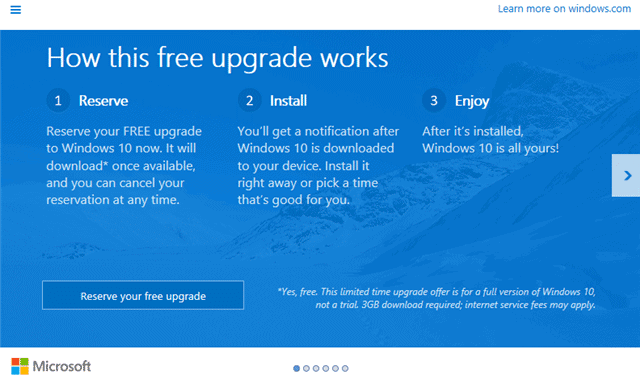 Windows 10 upgrade is free for all Windows 7/8/8.1 users for a limited time. As long as you have a genuine Windows license, your upgrade will be free. If you bought a new computer between release announcement and the release date with Windows 7/8/8.1 as your OS, you’ll be eligible for the free upgrade. While Microsoft has confirmed they will allow non-genuine users to upgrade, they’ll still keep a non-genuine copy of Windows 10. They don’t want to condone piracy but they want as many people as possible to “upgrade” to Windows 10 from the get-go and this is the first time they’ve allowed this type of upgrade to occur. In April 2015, Windows Update KB3035583 was released. This was an idle update that allows Windows 7/8/8.1 users to “reserve” their Windows 10 upgrade. What does this mean? It’s fancy talk for saying Microsoft is able to pre-download Windows 10 upgrade and prepare your PC for the upgrade. If you don’t reserve your upgrade, you’ll still be able to upgrade anytime the one-year time frame since release, at your leisure. The reservation simply lets you pre-download Windows 10. DVDs now require third-party software for playback. Popular games, such as Hearts, Minesweeper and Solitaire will be removed. USB floppy drives will only be supported by driver updates after Windows 10 is upgraded/installed if drivers are available. Windows Live Essentials’ version of OneDrive will be uninstalled and replaced with app version. Windows Updates will be automatically enabled for Windows 10 Home users; Window 10 Pro and Enterprise users can turn them on/off. Cortana is only available in the US, UK, China, France, Italy, Germany and Spain at launch. Speech recognition will only work via microphone. Windows Hello requires an illuminated infrared camera and/or fingerprint scanner. Xbox Music & Xbox Video only work in certain regions. Snapped applications are limited to the display minimum resolution. Microsoft Account will not be required for some apps to be used at all. You can read the full breakdown of Windows 10 specs at Microsoft’s web site here. It’s easy to see why Microsoft is pushing free upgrades the first year to encourage those burned by Windows 8/8.1 to climb back on the ship. However, if you don’t have a genuine license to upgrade, you’ll be able to buy Windows 10 at retail pricing. You’ll also be able to upgrade your Windows 10 license to something better. This is the same pricing structure Windows 8/8.1 used. Retail licenses are available with all major retailers and Microsoft.com. Microsoft has realized what rides on the successful release of Windows 10. They failed consumers with a rushed Windows 8 product, unimpressed them with the touted Windows 8.1 upgrade, and have tried to mash Windows 7 and Windows 8 together in what is now released as Windows 10. Time will tell if Microsoft’s latest OS will turn consumers back to the Windows brand and if they will truly learn to love how their PCs work again. So far, Windows 10 does a decent job of bringing together the best of Windows 7 and 8, and we hope Microsoft does a better job of building upon the salient features of Windows 10.